Next week we’ll be heading to Barcelona for the USK symposium. I’ve been busy planning my workshop on the subject of spontaneous drawings of people ‘in the wild’. That is, un-posed, un-official subjects, as opposed to posed models. In many ways it’s more fun than going to life drawing class. It’s certainly more challenging to capture people in motion – plus we’ll be trying to tell a story at the same time. 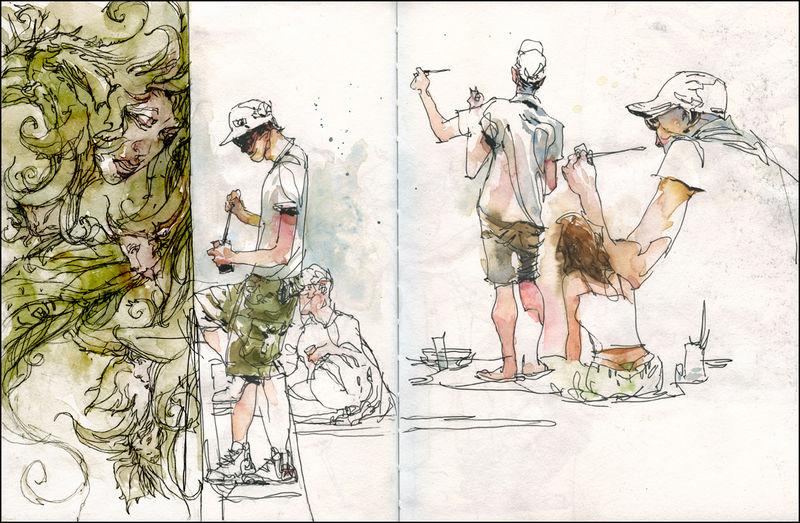 The ‘handouts’ are based on these sketches from the FIMA festival (Festival International Montréal en Arts) in Montreal. I was downtown working on a collaborative mural with a bunch of artists from EnMasse and Trio Magnus, among others. 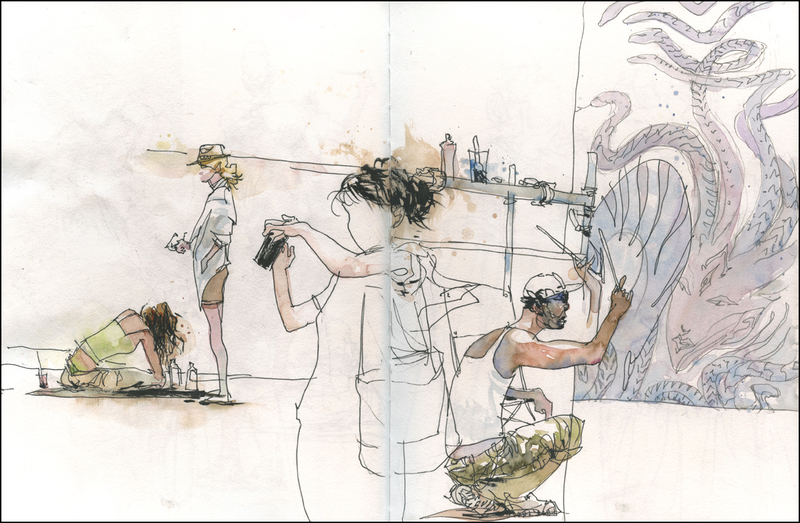 There is also a companion video – done at home using sketches from a USK:MTL sketchcrawl in our underground Metro. This was way back in early spring – that’s why everyone is wearing toques and scarves. It’s five minutes of me sketching under the video camera. Seems like the best way to show exactly what we’ll be doing in the workshop. So elegant! You make it look effortless! Superb Marc! Thanks for posting this. I am envious of your soon-to-be students in Barcelona, Marc. These sketches are elegant. Thanks Marc. These pdfs are incredibly helpful. When you say ‘regular ballpens’ for the pen lines, do you an example? Thank you again. Hey Nigel – just anything that is a ‘gel writer’ or ‘rolling ball tip’. I a model called Uniball Signo – bought a few boxes of 25 and am still going through them years later.
. Although I have a bottle of ink to use at the moment – trying to save on Plastics – I may go back to markers and uni-pens after. Well, that’s a legit reason. Dip pens it is then! With wooden handles. What’s the paper you use on this one? I really appreciate your Art. Hey Matt – these are done on a Stillman and Birn Alpha sketchbook. I am so excited for Barcelona – thank for sharing these! Thanks, Marc! Much appreciated. Have fun in Barcelona!